← Brace Yourself: Orthodontics and Sparkle? Oh Yes! 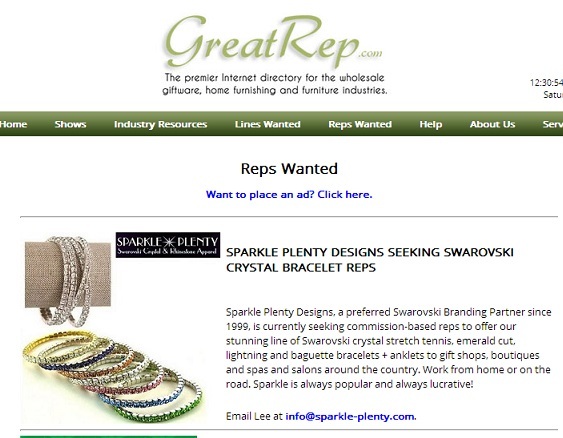 Sparkle Plenty Designs, a preferred Swarovski Branding Partner since 1999, is currently seeking commission-based reps to offer our stunning line of Swarovski crystal stretch tennis, emerald cut, lightning and baguette bracelets + anklets to gift shops, boutiques and spas and salons around the country. Work from home or on the road. Sparkle is always popular and always lucrative! Do you host home parties? What a perfect add-on to make sweet sparkling commissions! Please see our ad below — if you are interested, give us a call at 215.389.1877 or email us at info@sparkle-plenty.com. Let’s BLING great things to life — together! This entry was posted in baguette bracelet, body crystals, corporate gifts, crystal bracelets, Crystallized, genuine swarovski, sales rep wanted, Uncategorized. Bookmark the permalink.